Before I head out of 1-2 Thessalonians I thought I would share some of my journal jottings. For those who are joining along in this journey of seeking the Lord with pen and paper, I wonder how are you doing? Is He igniting your heart? Are you finding Him faithful? He IS faithful, but are YOU personally finding that true in this season? 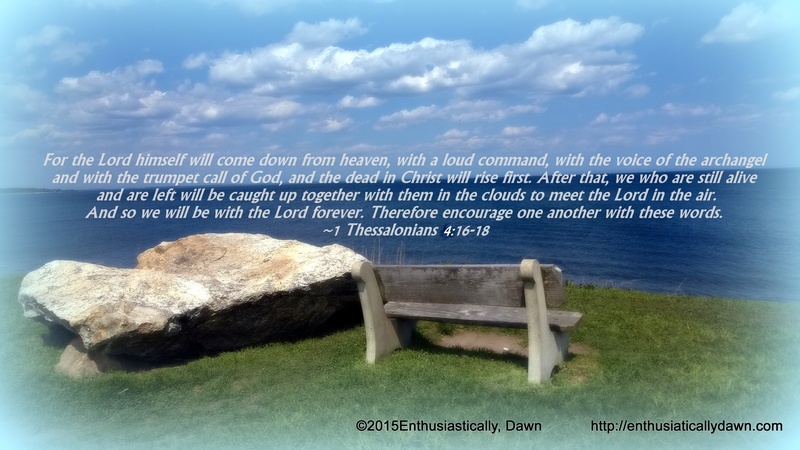 I have been pondering, meditating and squeezing out the message of Paul for the Thessalonians and God’s message for me this leg of my journey. If there is ever a message that should simultaneously strike both joy and sobriety into a heart, this is it. You want to cut to the chase about living out your Christianity, friend? It’s right there. A short order but a tall one, no less. Fortunately, we who are sitting on the shoulders of the Savior are loved, cherished and empowered through the same grace that got us into the race to begin with. See, it’s not about you, me or the Boston Red Sox! When was the last time you looked up? When was the last time you saw the clouds and said, “He’s coming!” Because, He is. This is where you and your fear of flying will part. Because when Jesus returns, we who will meet Him together in the air will have no fear. You think about that when you look at those clouds this week. If you are in Him…you can take comfort in all I share today. There is no safer place to be. So for today I will leave you with my short (and tall) list from 1 & 2 Thessalonians. Just my working out on paper these words as they make their way to my heart, mind and soul. 5. Wearing the Hope of Salvation as my helmet. I could cross reference many verses, as many popped into my head as I reflected on the passages, but especially, Ephesians Chapters 4-6. If you want to see more of my To Do List from 1 Thessalonians, see my meditation on 1 Thessalonians 5 by CLICKING HERE. I decided to break this into two posts as it was getting exceeding long. Sorry about that, but there were a few things a higher authority seemed to be leading me to write in this post that were not initially in my mind.